YOU MAY NOW EDIT WHAT IS ON THE RESOURCE SHEETS TO FIT THE SPECIFIC NEEDS OF YOUR STUDENTS. You may edit the the resource sheets, graphic organizers, index cards, etc. by typing straight into the document or adding text boxes. I've included 255 pages to support the weekly writing in Benchmark all year long. 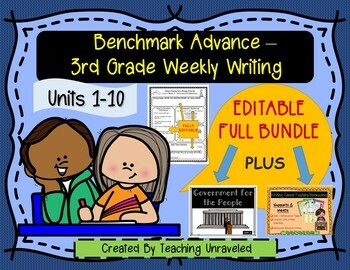 The resources align with and support the revision and editing lessons embedded in each weekly writing process. The focus of this product is the main sheet (there are 3 per unit in Units 1-7 and 1 per unit in Units 8-10). 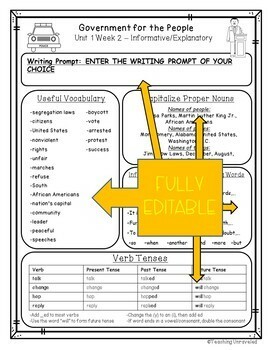 This sheet includes a space for the prompt of your choice, useful vocabulary, and revision and editing resources/examples students can use throughout the week. 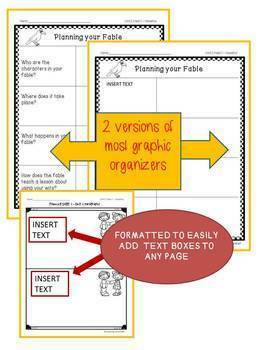 The product also includes a variety of graphic organizers students may use for prewriting or drafting. **This product contains handy resources for students in your small groups/writing workshops, students working independently, or students who need an all-in-one resource sheet. **By purchasing this product, you understand that it is meant to be used in correlation with Benchmark Advance California. I am not affiliated in any way with Benchmark Advance, nor is this an official Benchmark Advance product. **Please email me at teachingunraveled@gmail.com if you have any questions. Thank you!